Brides and grooms are putting more and more effort into getting every detail of their weddings perfect. They want there to be unique and memorable touches that set their festivities apart from the rest. This can be done with something as complicated as a theme wedding or just some very unique wedding favours. And unique wedding favours require some unique wedding favour boxes! Soopak can help. Here are a few of our favorites for adding that perfect touch to your clients’ wedding favours. Wedding favours that involve food are always popular. This type of box could be appropriate for cupcakes, tiny pies, jars of candy or other food. Votive candles would work well in this type of box and possibly custom drink ware if it is wrapped first. The convenient handle makes for easy carrying. Hexagons are a pretty unique shape for just about anything and these wedding favour boxes can add a touch of sophistication and a designer feel, especially with the addition of some embossing. They will work well for round items such as round bars of soap, candles, cookies, tiny plants or coasters. Pillow boxes are suitable for a wide variety of items and the ease of closure means that custom favours can be assembled quickly. The curves offer an interesting shape that will make your favours stand out. Candies, key chains, bottle openers, and sunglasses for a beach wedding are all items that would work well in these wedding favour boxes. As the name implies, this one is perfect for cupcakes or other food items such as cookies or doughnuts. The window on top lets guests see those wonderful sweet treats peeking through without them having to open the box. 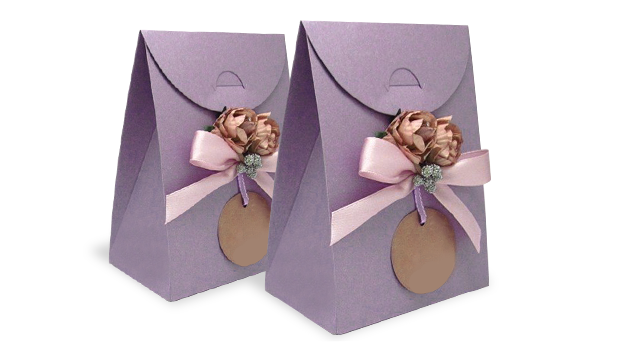 These wedding favour boxes can accommodate a wide variety of gifts and is very versatile. Customized coloured pencils and paper, soap, a few tubes of lip balm, picture frames and bottle openers are just a few of the items that would work well. You could easily embellish this style of box to reflect a particular theme. Selecting unique and attractive wedding favour boxes can really make the items stand out to guests and shows the attention to detail you clients are looking for. Soopak’s short run packaging services are a great choice for your packaging needs. Our quick turnaround times and commitment to quality will help make sure your clients are happy! Contact us today for your custom quote.